Apartment, 4 - 6 people, 3 room/s, 2 bedroom/s, 1 bathroom/s, approximately 67 - 74 m², 1 - 2 floor/s, apartment on ground floor or floor 1, 19. Feature: Property on an estate (8 units in total). Equipment: satellite TV; DVD, stereo; internet access Wi-Fi (included); laundry drier, iron/ironing board; safe; electric heating. Electricity according to consumption approximately € 0.15/​kWh (56.00 kWh/​week included). Final cleaning by tenants or against payment, € 70. Optional intermediate cleaning against payment, € 30/​hour. Holiday resort tax. Linen/towels Bed linen available. Towels must be brought along. Change of bed linen, € 15 per queen-size bed bzw. € 10 per single bed. Towels available on loan, € 6 per person/​change (on order). Deposit € 400 (in cash, French cheque's). Cot € 30 per week (on order). High chair € 20 per week (on order). Buggy € 20 per week (on order). Pet 2 animals allowed, € 45 per pet and week (please advise prior to arrival). Situation: in the hamlet Port d'Envaux. Estate (shared use): approximately 8000 m², partially self-contained (fence), trees. Outdoor facilities(shared use): terrace, barbecue. Pool (shared use): 12.0 x 10.0 m, 1.00 - 1.80 m deep, 11/05/19-05/10/19. Infrastructure: reception (available during the whole season). Plot description: terrace, further terrace (roofed), furnishing provided. The apartment is described as good value for money. 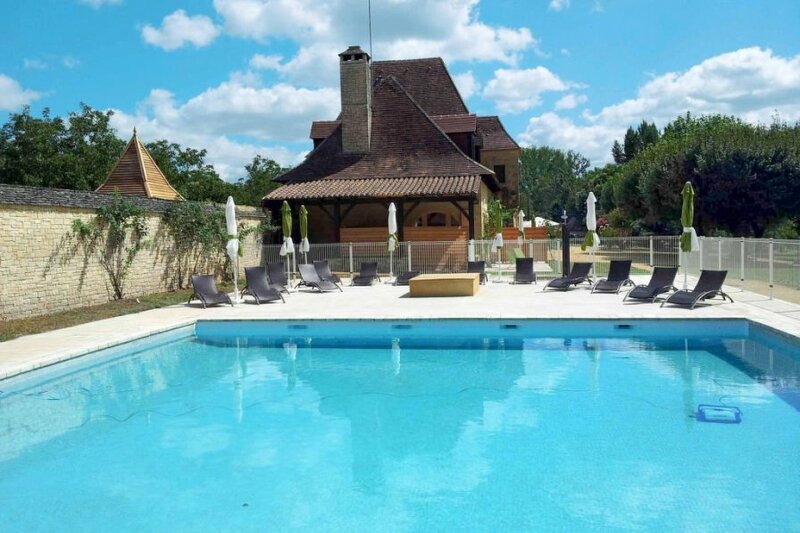 It has a swimming pool and is located in Saint-Vincent-de-Cosse. The nearest airport is only 40km away. It is set in a convenient location, 4km away from the city center.